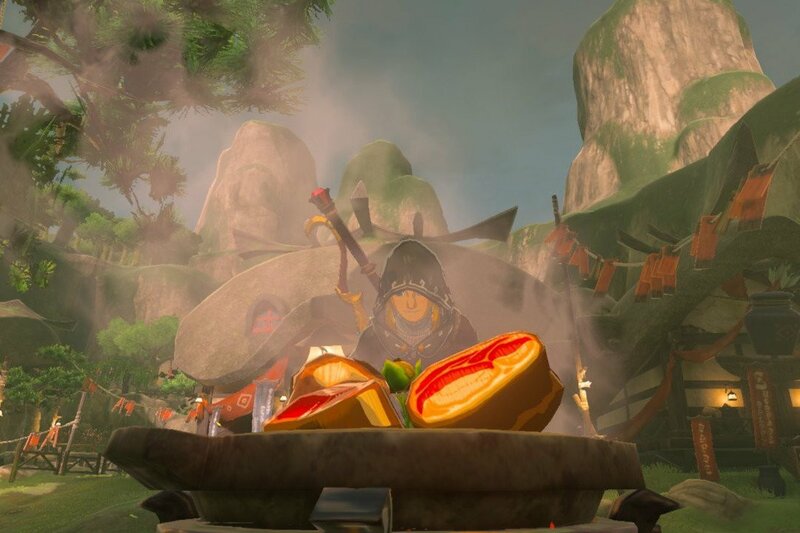 Cooking and Eating in Breath of the Wild: Pros and Cons – What's in a Game? It gives you another choice in how you can approach several goals in the game. Want to beat a hard enemy without having to worry as much about avoiding attacks? Eat something to give you a defense boost. Want to climb higher up while still choosing heart containers at each point in the game? Prepare a few stamina meals. Want to withstand the cold while not changing your armor? Add some spice to a meal. The list goes on and on. It is a feature that allows players willing to invest more time and memory to do better in the game without being required for players who don’t want to. Players that invest time will get great rewards. Players who choose to avoid cooking must achieve their goals through other means. The above two points contribute to keeping players in flow through difficulty management. Cooking keeps the difficulty of the game is in the player’s hand. For example, players having trouble in battles can go cook some ingredients together to make the battle easier. A player that is doing fine in battle, doesn’t need to eat, so they will save their resources for later, keeping the battle an appropriate difficulty. This also helps people who want to do various challenge runs (3 heart, only starting armor, etc) another way to be able to complete the game. Coming up with recipes feels natural and can be fun because it can surprise you in various ways. Cooking gives additional meaning to exploration by filling the world with interesting ingredients and collectibles. In this vast world, they needed something to fill it with. Like how durability creates rewards through weapons, being able to mix ingredients together and eat them creates a resource that the game can reward you with. I know that I started going out of my way as soon as I saw my first flameproof lizard so I could craft more flameproof drinks for Death Mountain. The User Experience makes it cumbersome to cook things. Going to the menu, picking what you want, placing it in a pot. Cooking things you’ve already cooked or cooking in bulk can get repetitive. This is valid and fair. The user experience throughout the game has problems and is one of the major ways flow could be improved. Cooking isn’t immersive, it’s the only menu-based solution in the game. When I saw this complaint, I found it to be fascinating since immersion is one of the main themes of the game. This complaint has merit: players need to go to the menu to cook and eat and this breaks immersion in the game. But, this isn’t the only place players need to go to the menu. Changing armors and dropping bows and shields breaks immersion as well. In the end, it’s more evidence for how the UX in the game is lackluster. Eating a full meal in battle is unrealistic and can break immersion. It does seem silly – you can just pause the game, eat 20 bananas, then come back. Where did the peels go??? Maybe during combat, the game should not let you pause to eat, but let it happen in real-time. I would like to see this as a choice in the menu, like the Active vs Wait mode in FFXV, because less-skilled players are going to want to pause completely. Armor switching is so easy it makes cooking less useful for environment management. If certain armor (cold resist, stealth) was obtained later in the game, you could use cooking earlier on and then armor, making cooking feel more useful. I agree with this sentiment. I was disappointed that it was fairly easy to avoid the environmental effects by equipping armor instead. That being said, the entire game is built around having options and choices, so I think it’s a good decision to allow for armors and cooking to solve your problems. I probably would’ve made it harder to get environmental armor. It was satisfying in Death Mountain to have to climb up using some method other than armor. Another way to mitigate this might be to make armor have durability, but I think this would go too far in annoying the player. Eating for combat can make the game too easy. Cooking allows you to avoid coming up with more clever solutions to problems. A major theme of the game is, “There is no correct way to solve problems. Explore and find whatever solutions you want.” The player finding solutions by cooking definitely contributes to this. Whether or not this is good game design is questionable. If you force the player to be more clever but they can’t figure it out, they will get frustrated and leave the game. In a game that strives to be open-world with a wide target audience skill level, I think it was appropriate for Nintendo to follow the theme and give people more choices using cooking. Personally, I found cooking to be annoying, so I tended to avoid it. Still, it’s a great addition to the game because I was able to choose to avoid it. I can see the choices it opens up in the game. For those who want to take the time to do it, it provides one more core mechanism to achieve the theme of the game, exploring possibilities and achieving goals your own way.